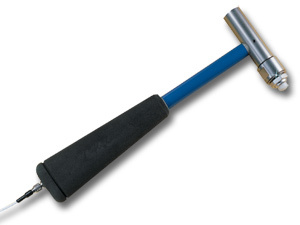 OMEGA's IH101 Impulse Hammer imparts motion to a test structure with the hammer tip, while simultaneously measuring the magnitude of the impact. This allows for analysis of the dynamic response of the structure being tested. Accelerometers mounted at various locations on the test structure measure the response of the structure. If a Spectrum analyzer or a computer is used, input/response data can display transfer functions and perform modal analysis. The hammer is acceleration compensated, which means that it responds purely to force and is unaffected by the vibration in the hammerhead after impact.